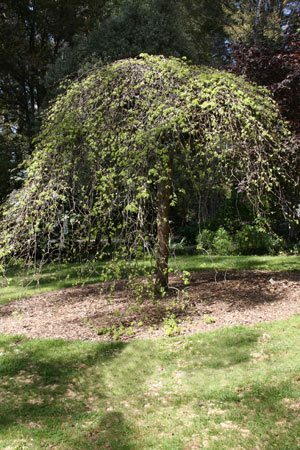 We think that Ulmus glabra pendula is one of the very best weeping trees for small to medium sized gardens. Wonderful shape, great foliage and enchanting as well. If you have the right climate, and the space, grow one. The Weeping Elm is Ulmus glabra ‘Pendula’ also known as the ‘Wych Elm’. A mature specimen in the garden make a wonderful ornamental feature tree. From spring to autumn it is covered with largish deep green foliage. Forming a naturally flattened top, the long branches will droop down to form a ‘skirt’ almost to the ground. In autumn the foliage turns a good yellow then in winter this deciduous tree with its bare branches makes an equally interesting ‘sculptural’ addition to the garden. Although in the natural environment these trees will reach over 8m in height they are commonly grafted as a ‘standard’ at between 2m and 3m depending on the grower. Growing well in cool to temperate climates Ulmus glabra ‘Pendula’ may require water during dry periods. Pruning is generally not required, although some gardeners do like to lift the long drooping branches above the ground. As with all els in Australia, protection from elm leaf beetle is recommended.